Concept artwork, and an in-game screenshot of Squiddicus from Donkey Kong Country Returns. Squiddicus is an enemy that first appeared in the game Donkey Kong Country Returns and later appeared in its Nintendo 3DS remake, Donkey Kong Country Returns 3D. Despite his name, Squiddicus more closely resembles an octopus than a squid. In these games, he only appears in the level Stormy Shore, as one of the main obstacles. Squiddicus later appears in the game Donkey Kong Country: Tropical Freeze exclusively in the Sea Breeze Cove level Irate Eight. Squiddicus is a giant, light orange octopus with spikes and suction cups on his arms. He has large white eyes with black pupils and darker orange wavy patterns on his head. In his appearance in Donkey Kong Country Tropical Freeze, Squiddicus is larger than in Donkey Kong Country Returns. 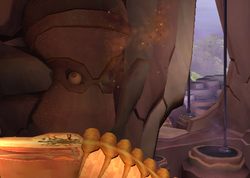 For the majority of Stormy Shore, Squiddicus only appears in the level's background, where he is seen destroying a ship. Nearer the end of the level, Squiddicus will attack the Kongs by blocking the way with his arms, which will cause them to lose a heart on contact. Donkey Kong and Diddy Kong can avoid the arms by jumping over them, and must jump between sides when in the Climbing Grass segment. Squiddicus will also use his arms to break certain platforms after a length of time. In this game, Squiddicus cannot be defeated by any means. In Donkey Kong Country: Tropical Freeze, Squiddicus is first encountered in the level Irate Eight in the game's fourth world, Sea Breeze Cove. He first appears in the level in the area with the Dixie Kong Barrel, where he uses his arms to tear down part of the cave. His arms still cause the Kongs one heart of damage on contact. He also produces ink which rises from the bottom of the screen and causes the Kongs to lose a life instantly upon contact. At the end of the level, the Kongs can use hanging land mines to damage Squiddicus by launching them at him, which will eventually defeat him. Squiddicus cannot take damage during the first part of the level. Enperā Takora King/Emperor "Oct-zilla". タコラ takora is probably from タコ tako meaning octopus, and Japanese movie monster ゴジラ Gojira, Godzilla". Fossil in Boulder Roller resembling Squiddicus. At the end of the level Boulder Roller, a fossil can be seen which resembles Squiddicus, suggesting that he might be part of a species. Another similar fossil can be seen at the start of the Stormy Shore level. This page was last edited on March 23, 2019, at 11:01.